Michele Moses is a commercial interior designer and illustrator who lives in Buffalo, New York, but sometimes wishes she lived in Paris, France. When she was young her parents bought her a stuffed frog which she adored until it wasn’t cool to play with stuffed animals anymore. Many years later to her surprise, this frog she loved turned up stashed in a trunk by her mother with other bric-à-brac from her childhood that she was so glad to find saved. Fifty-two frogs later Michele has determined the only thing she can count on to remain constant in her life are her frogs. Through her love of frogs, cooking and Paris, a new frog entered her life. His name is Chef Grenouille and of course is French for frog. Although Chef Grenouille flies between Paris and Buffalo regularly, he has become very much attached to Michele and her significant other Kevin and is spending much more time in Buffalo. The story you are about to read will introduce you to their friend Chef Grenouille and show you why he is so special. But Chef Grenouille has one character flaw that he has not been able to overcome. He worries so much he is in danger of losing control of his life. He is about to leave for a much needed vacation when he is informed his restaurant, Chez Grenouille and his wonderful reputation will be put to the test soon by the famous restaurant critic, Mimi LaRue. 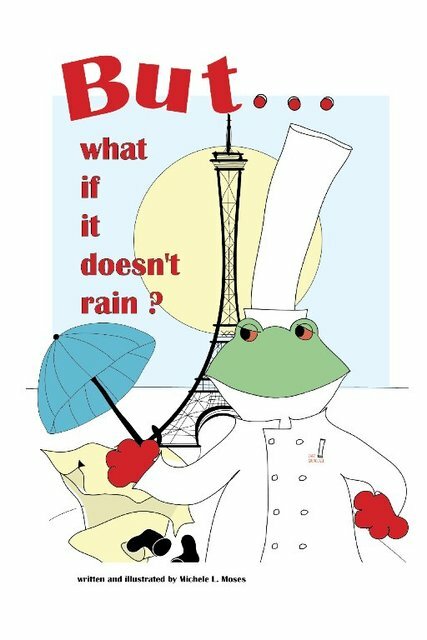 This short story will amuse children and adults alike as a magical frog named Verdi takes Grenouille for an adventurous ride in an effort to convince him that worry is definitely useless. And it just might make you a little bit hungry!